Few fads have gained such a strong and consistent foothold in society as has the movie “the Rocky Horror Picture Show.” For more than 25 years, fans have flocked to the midnight showing of the movie but mere attendance figures are just the beginning. 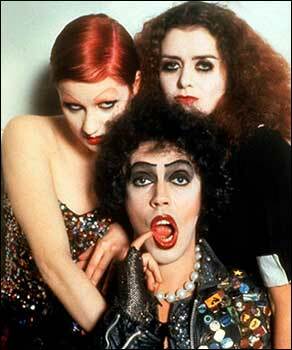 The Rocky Horror Picture Show was originally a British stage musical created by Richard O’Brien in 1973. The play was developed to focus on the “glitter rock” movement that was popular at the time. Filmmaker Lou Adler decided to take advantage of the popularity of glitter rock, and bring the production to the big screen. He cast Barry Bostwick and Susan Sarandon as a nerdy couple abducted and seduced by the nefarious Dr. Frank N. Further. After Dr. Further is killed, it is revealed his castle was part of an alien invasion. By spoofing both horror and science fiction movies with a glitter rock theme, Adler anticipated a financial bonanza from the film. Unfortunately, by the time the filming was completed, the glitter rock scene had disappeared from popularity. Adler, fearful of a potential bomb on his hands decided to limit the films release and only permitted it to be played at midnight shows. His decision became a stroke of genius. Many young movie fans had made midnight moviegoing a popular trend and these moviegoers turned Rock Horror into an instant cult classic. The movie fans not only flocked to the theater but they returned repeatedly, week after week, often bringing more and more friends with them. Even more surprising than their fanatical following was their elaborate display of audience participation during the movie. Members of the audience would loudly recite the dialogue and the songs and threw rice, toilet paper and other items from the movie. If this weren’t enough, many in the audience dressed like their onscreen heroes and walked onto the stage in front of the screen and acted out the scenes. Explaining the prolonged popularity of the movie and the “experience” it spawned is a difficult task. Much of its initial appeal was its frank presentation of bisexuality in a harmless, comedic manner. Part of it had to do with the late hour at which it was shown. Most important was the fact that the movie was so silly and and pointless that it was simply fun to watch and laugh along with. Whatever the reasons, it was still being played after 25 years and spawned books, magazines and conventions for its fans. As fads go, Rocky Horror Picture Show has enjoyed one of the longest and most devoted following of all time, and will probably continue to do so for years to come.